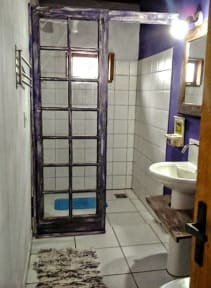 Campeche Hostel i Florianopolis, Brasilien : Boka nu! Our cancelation fee policy the limit is 48 hours before. The following group types are not accepted by this hostel: Junior / Primary School, Stag/Hen/Bachelor Party, Sports Group, Cultural Group If you have misrepresented the type of group you are booking for, your booking may be cancelled by the hostel." Welcome to Campeche Hostel, we are a proudly family hostel with a rustic vibe! 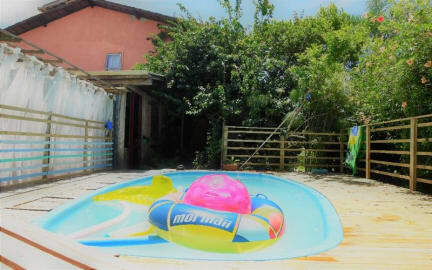 With pool, a nice and cozy play area with snooker , bbq, tv, a complete kitchen, an ornamental fish pond with beautifull fishes and also a big pond at the back at the property so you can free the fisherman (women) inside of you., wi fi at the whole hostel, a nice and safe parking lot also available. Towels and locks ( for the lockers) are not included towels R$5,00 each and bring your lock so you are responsible for it ( we can storage with us, but is better if you have your own). Located in the one of the most famous beaches in Floripa we are since november of 2008 in the hostel scene here in the island and also locals so we have the best tips for you to get around! !Make your reservation now! !